Glass Blower adds big bonus to the trade of the region and also encorages the peolple happiness with a state of art masterpieces. Glassblowing techniques spread throughout the Roman world. Venice, particularly the island of Murano, became a centre for high quality glass manufacture in the late medieval period. Bohemian glass is a decorative glass made in Bohemia and Silesia from the 13th century. It was especially outstanding its manufacture in high Baroque style from 1685 to 1750. 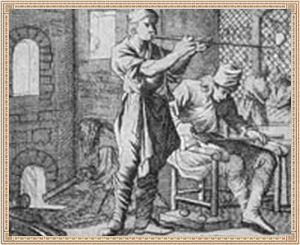 In the 17th century, Caspar Lehmann, gem cutter to Emperor Rudolf II in Prague, adapted to glass the technique of gem engraving with copper and bronze wheels. The blowing technique transformed the material's usefulness from a time consuming process, in which the medium was hot-formed around rough cores of mud and dung, into a mass-producible material which could be quickly inflated into large, transparent, and leak-proof vessels.